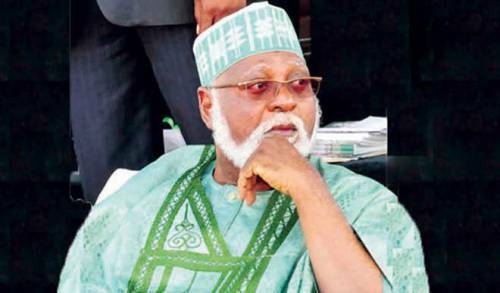 A former Head of State, Gen. Abdulsalami Abubakar (retd), has urged traditional and religious institutions to be in the vanguard of issues capable of advancing the course of inter-ethnic and religious harmony across the country. He made the call while delivering the maiden General Abdulsalami A. Abubakar Foundation Peace Lecture, titled ‘Collaborative Peace Building in Nigeria,’ at the University of Ibadan, on Friday. Insisting that the country was stronger socially and economically as a united entity, he warned that nowhere across the African continent could accommodate the people in the event of a breakup. As the countdown to the 2019 general elections continues, the former leader further urged citizens to be wary of incendiary statements but promote things that unite the country rather than those things capable of dividing it. The occasion presented a veritable platform for the Governor of Oyo State, Senator Abiola Ajimobi, to make a formal declaration to contest the Oyo South senatorial district election on the platform of the All Progressives Congress, in 2019. Already, the governor said he had appeared before the APC screening committee in Abuja, having obtained the nomination and expression of interest forms, ahead of the October 3 party primary. Abdulsalami had earlier called on academic institutions, especially universities, as well as traditional and religious leaders in the country to concentrate on how to change the attitude and thinking of the citizens to enhance the country’s unity. Announcing his senatorial ambition, Ajimobi said he was confident of clinching the party’s ticket judging by his impressive credentials, which he said had also put him in good stead to win the seat for the APC. Ajimobi said, “I was in Abuja yesterday (Thursday) for our party’s screening exercise for senatorial aspirants. I want to announce to you that I am contesting the Oyo South senatorial district ticket under our great party, APC. He described Abubakar as an epitome of humility and successful leadership, which he said were the unique attributes that made it possible for the former leader to succeed in overseeing the transmission of power from the military to the political class in 1999. Ajimobi said peace was paramount in the development of a society, stressing that the enthronement of peace when his administration came on board facilitated the socio-economic development of the state. The governor said, “I have not met anyone who epitomises humility and love for peace than General Abubakar. He is also the only one that has never made any attempt to come back to power through politics. “He is so detribalized, humble and full of respect for all. We are here to honour a man of honour and the university, as well as the World Peace Day.